Holiday country house with a small annex, in a valley rich in olive groves, deep in the countryside of the hills between Pisa and Florence. 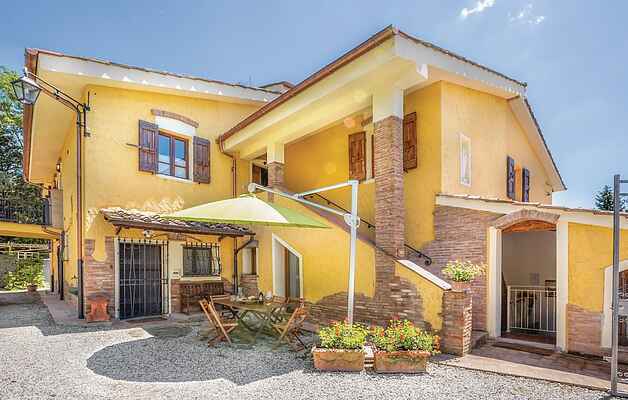 Its location allows guests to easily reach the sandy shores of the Tyrrhenian seaside, as well as the main tourist destinations in central Tuscany. It has a nice view over the surrounding countryside. For private use: outdoor space equipped for alfresco dining in front of the house and exlusive pool (12,5 m x 4,5 m; depth: 1,20 m - 1,60 m) with shower and grassy area (350 m2) reachable walking uphill after having crossed a small lane leading down to the properties (ITP399, ITP530). Large parking place at 50 m. Private chef cooking Tuscan meals can be requested in advance (with fee). The farm produces extra virgin olive oil red wine vinegar, citrus-flavoured salts, saffron, herbal teas and some cosmetic products. Distances: Marti 2 km, with groceries, Pontedera 12 Km, Casciana Terme 32 km, Pisa (aeroporto) 33 km, Lucca 38 km, San Gimignano 44 km, Tyrrhenian beaches 45 km, Florence km. The main house is arranged on two levels. On the ground floor: living room (Tv Sat) with fireplace and double sofa bed, kitchen/dining room area with fireplace, two double bedrooms, bathroom with shower. Upper floor with double bedroom (gambrel roof). The annex is composed of a living/dining room with kitchen corner, double bedroom, bathroom with shower. Baby cot and high chair available. One side of the house is attached to another property (code ITP530).